Through the benevolence of the late Harold Englehardt of Lowell and his bequest, the Grand Rapids Community Foundation’s Lowell Area Community Fund, awarded monies to FHS to get the job done in what we hoped would be mid-March. Mother Nature strikes again, yet Villagers and volunteers came to the rescue. Craig Wood’s young crew scaled the slippery slope and patched new critter invasion routes which just seemed to appear as soon as we got the last ones secured. Not to worry. The weather did improve and Risner’s Roofing & Home Improvement of Lowell installed a beautiful new roof. Thank you, Grand Rapids Community Foundation, Lowell Area Community Fund, Risner’s, and timely help from Village volunteers. We couldn’t have done it without you! And, while you’re surfing check out www.fallasburg.org Last December, FHS engaged Addorio Technologies, LLC, of Lowell, to redesign and launch a new website. The first steps were to create basic “Home” and “Contact” pages for the Society which went live in January. The subsequent work, the fun part, has been in development and has just gone up on our site. This work comes courtesy of the Lowell Cable Television Endowment Fund which awarded FHS a grant for the implementation of additional Internet pages. 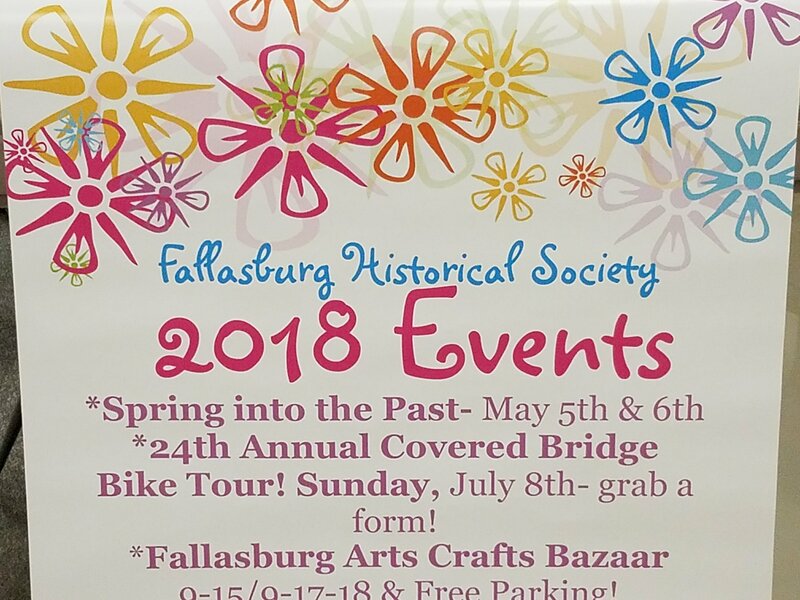 These pages will highlight and provide a means for registration and payment for “Events” like the upcoming 23RD Annual Covered Bridge Bike Tour on Sunday, July 9, and the Fallasburg Farmhouse Soiree on Saturday, August 5. On another Internet page, you’ll find links to other organizations like “The Past Online,” Lowell Area Historical Museum, and the Fallassburgh Flats, our Vintage Base Ball Team. Of course, there’ll be a “Photo Gallery” page with four seasons of village pictures and historical tidbits. But, the page I’m most excited about is “History’s Mysteries.” Every museum has them, pictures you can’t identify of people and places, artifacts that baffle-what is that? Well, Fallasburg has their share, and you’ll be able to play history detective. We’ll put them up on the site, and who knows what might happen. Thank you to Addorio, and the Lowell Cable Television Fund. Technology is daunting to us old-schoolers, but you’ve helped us broaden our horizons and share our resources as only technology can do! Lowell Community Expo at Lowell High School in late March brought together Fallasburg Historical Society legends Ed Roth, Dottie Blain, and Addie Tower Abel, along with current FHS Treasurer, Alan Rumbaugh, Board Members Melanie Brim and Tracy Worthington, all as goodwill ambassadors from the Village. The group was out to make new friends and so they did. A local Boy Scout, John Lothian, in pursuit of his Eagle Scout Badge wants to follow up on our new roof and paint the Fallas House for his community service project. Recently retired from Grand Valley State University, Communications Specialist, Mark Kuzee, stopped by. He has relocated to the Lowell Area with his wife Sue, has a penchant for woodworking, and finds exciting the challenges of maintaining historic properties just like our man of many hats, Alan Rumbaugh. We’ve already pressed Mark into service making custom siding patches for critter holes in the wildlife refuge we call Fallasburg Village. Spring cleaning in Fallasburg was undertaken in several Saturday morning sessions. Tina Cadwallader polished up the Schoolhouse and got it ready for Murray Lake Elementary School’s 1ST Grade Class visit. Alan Rumbaugh, Lisa Sostecke, Mark Kuzee, Frank and Patty Brechbiel and even Fallasburg Intern, Brianne Lynn spiffed up the Misner House filling a dumpster. And, yours truly recycled what amounted to the evolution of the personal computer: old monitors, keyboards, CPU’s, printers, and yes, mice, too. FHS volunteers Tracy Wprthington and Tina Sicialiano Cadwallader inside the Misner House during the Spring into the Past tour. On Monday, June 19, 2017 at the Lowell Chamber of Commerce, 7:00 p.m., FHS will hold our Annual General Meeting. This is an opportunity for our members to have a voice and our friends to offer an opinion. Most importantly, it’s a chance to get for all of you to get involved! We can’t do it without you! We hope you’ll come out and join us! 23RD ANNUAL COVERED BRIDGE BIKE TOUR, SUNDAY, JULY 9.